I used my T410 for more than 6 years, and it has had its share of problems. It had some hardware issues that luckily were repaired under warranty, but now it exhibits lagging and periodic blue screens of death. I guess this happens to a lot of computers when they get old. The price of a computer has dropped even further since when I purchased the T410, so I decided it was time to get a new one. The features I wanted for my new laptop were that it was lighter than the T410, had 16 GB of RAM, a 512 GB solid state drive (SSD), full HD screen, and costs under $1000. 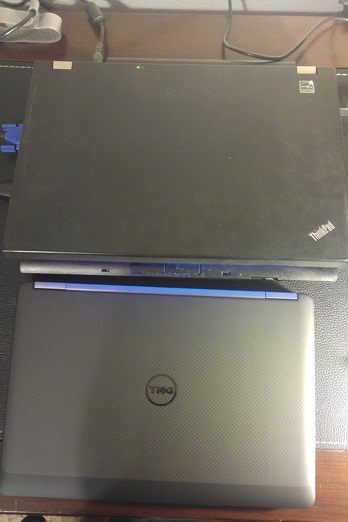 The reasoning for a lighter laptop is that I wanted to try something that was smaller and lighter. The T410 isn’t super hefty, but it still weighs a bit when I have to carry it on my back. The 16GB RAM requirement is because my work laptop has that amount and is 2 years old, so my personal computer should be able to match that. I wanted a 512GB SSD is because I wanted faster disk access. The perpetual storage is the slowest part of the computer, and having a SSD instead of a traditional mechanical hard drive will alleviate that bottleneck. I don’t have a lot of data, but a 256 GB or smaller SSD would be pushing it since I used about half of the 500 GB drive in the T410. This is 2016, so I think full HD screen should be a minimum given all the high resolution TV and cell phone displays we have in this day and age. As for the price… well you can buy a pretty decent laptop for $500 these days. I am willing to spend a bit more than that to get the features I want, but not that much more. This configuration fits all of my requirements. A new E7270 ultrabook with this configuration probably costs around $2000 with no discounts, but after the various discounts (since I bought a refurbished unit), coupon codes and cash back deals, the final cost came to around $750, which is a pretty good deal in my books. In case you were wondering, an “ultrabook” is just a thin and light laptop/notebook that uses a certain set of Intel technologies. Looking at the specifications, this E7270 comes with integrated graphics, but I’m fine with that since I don’t think I’ll play a lot of intensive 3D games. This unit comes with a touch screen, although it’s not as useful since the E7270 is not a 2-in-1 where the screen can completely fold over to the back into a tablet. I might try sketching using the touch screen to see how well it works. Finally, being a small and thin Ultrabook, the E7270 doesn’t come with an optical drive, but I can live with it since my work laptop has an optical drive, and USB sticks are more convenient anyways. 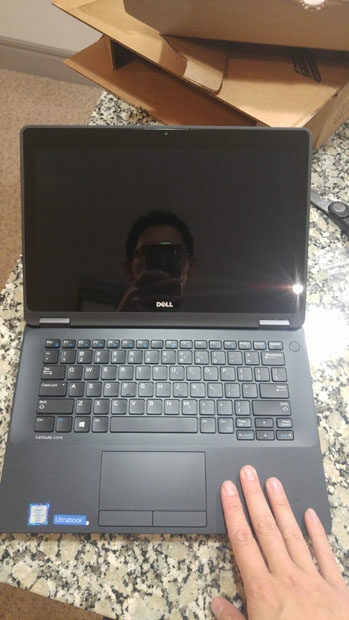 My new laptop arrived in this generic Dell brown box. 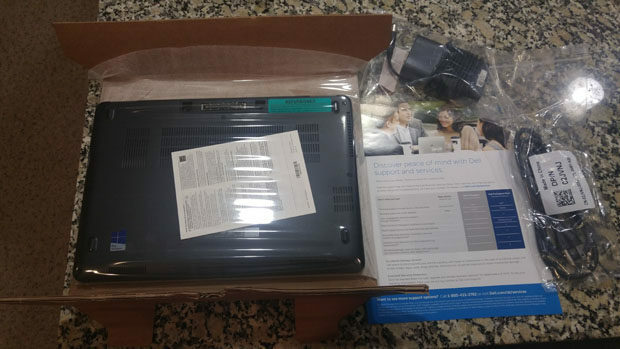 A week after I put in my order online, I received my laptop at my front door. The unit came in a generic Dell brown box. 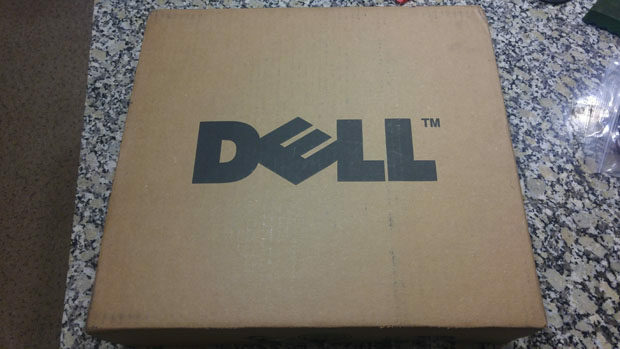 Dell isn’t exactly known for fancy packaging, but as long as the box protects its contents then it’s fine. Inside the box there is the E7270, the power adapter and cord, and a pamphlet about the warranty. Contents of the box. Just the laptop, power cord and warranty pamphlet. 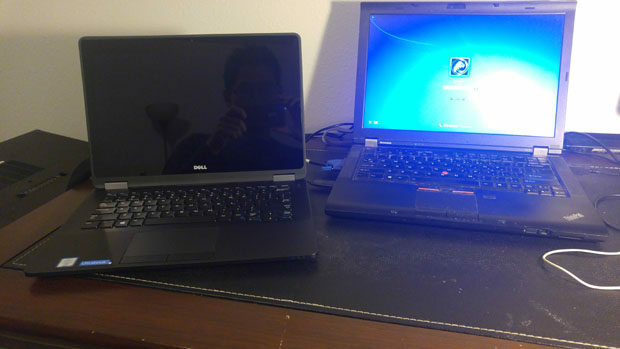 I picked up the E7270 for the first time, and it is considerably smaller and lighter than my old T410. The under-3-lb weight will mean this laptop will be easier to carry around The chassis feels very solid, which is befitting for a business-class laptop. The whole laptop is black and dark grey, and the top has some sort of soft-touch material that feels pretty nice. Opening the laptop reveals the screen, the chiclet style keyboard, the trackpad and the power button. Due to its smaller size, there are definitely fewer buttons on this E7270 than my T410, although the size of the basic keyboard is similar, and the trackpad area is actually larger on the E7270. The E7270 opened. You can see my reflection on the glossy screen. After checking out the exterior, it was time to power-on my new laptop to make sure it works. This is the first machine I’ve used that came with Windows 10. It looks a bit different than all the Windows 7 machines I’ve used, but I’ve managed to set up the laptop and transfer my files over, so I think I can handle the change. The full HD screen on the E7270 looks really nice, and images are definitely sharper than on the 1440 x 900 screen the T410 has. 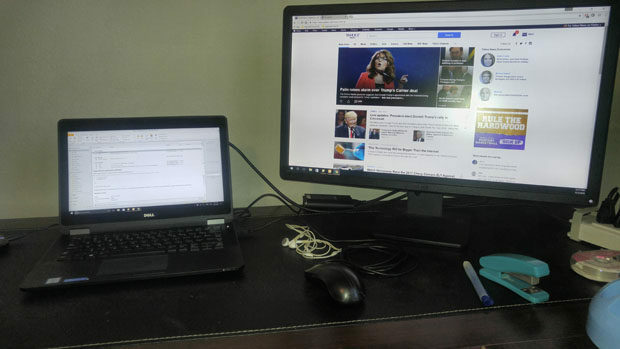 While the screen is smaller than the T410, it’s not a big deal for me since I plug into a 24 inch full HD monitor for home use anyways. I did have to pick up a HDMI cable and a HDMI to DVI converter to connect to my monitor, since the E7270 didn’t have a VGA port and the monitor only has VGA and DVI. So far, the new E7270 has been pretty good, but of course I’ve only used it for a few days. Everything is really snappy and quick, which is what I’d expect from a brand new computer. Hopefully it’ll remain snappy and quick for a long while, and not run into any major problems. The keyboard is fine, although due to the trackpad’s size sometimes I end up accidentally putting my hands on trackpad which causes the mouse pointer to move unexpectedly. The only things I’m missing on the E7270 when compared to the T410 are physical volume buttons. The T410 have dedicated volume buttons, while on the E7270 you have to use the blue Fn key + the function keys to adjust the volume via the keyboard. This is a change I just have to get used to. Finally, I haven’t had a chance to test the battery life, but I think these ultrabooks should last at least 5-6 hours for web browsing which should be fine. My new laptop set up and ready for daily use. 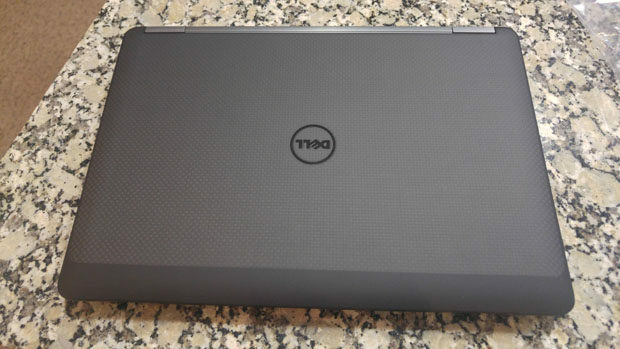 These are my first impressions so far of my new Dell Latitude E7270. 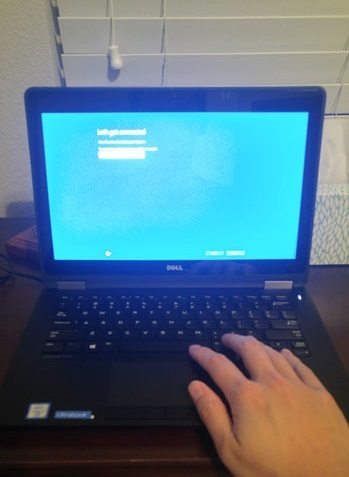 Hopefully this computer will work well for me for the next couple of years… the longer the better . As for my old T410, I already took it apart to vacuum the cooling fan. I’ll then probably reinstall Windows and give it to my dad who is using an even older and slower laptop.